Ask a group of kids where puppies come from, and they'll tell you wondrous stories of frolicking in Puppyland and playing with puppy friends. That's how The Humane Society of the United States begins its latest campaign launching on the glorious holiday that is National Dog Day. While things start out bright and cheery with the children painting pictures of puppies living the life in high-rise Manhattan puppy condos or in a world full of treats, the spot, created by Rokkan, takes a dark turn. While children have one way of looking at the world, the truth is many puppies come from puppy mills where, as one kid puts it, dogs "don't get kisses, they don't get good nights, they don't get nothing." It's a heartbreaking message to have the youngsters deliver, especially after their fantastical descriptions at the beginning. 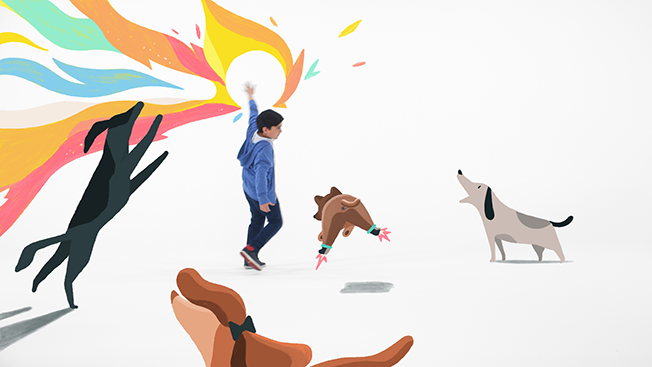 "Ask a child a simple question, and you'll get answers that are unfiltered, strange and beautiful," said Rokkan CCO Brian Carley. "These are the kind of answers we all wish were true. With these films, we take our viewers on a journey that's fantastical and silly, but it also makes it easier to tell the actual origin story that is cruel and hard to swallow." The campaign, "Don't Buy Into Puppy Mills," also includes three 30-second spots. Those looking to contribute in some way can sign a puppy pledge promising not to buy dogs online or from pet stores and to always consider pet adoption. "The work is meant to appeal to anyone who has the tiniest compassion for animals and care about their ongoing welfare," said Rokkan CEO John Noe. "From a more actionable point of view, we also wanted to reach people actively looking to purchase a dog as a pet."